In spite of their violence, the amount of material ejected in novae is usually only about 1⁄10,000 of a solar mass, quite small relative to the mass of the white dwarf. Only five percent of the accreted mass is fused during the power outburst. This is enough energy to make nova ejecta to go outward as fast as several thousand kilometers per second—higher for some novae than others. The star also brightens, from a few times solar to 50,000–100,000 times solar. 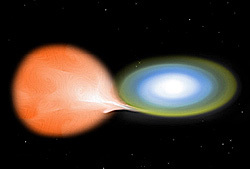 In 2010 scientists using NASA's Fermi Gamma-ray Space Telescope were surprised to discover, for the first time, that a nova can also emit gamma-rays (>100 MeV). ↑ "CBAT List of Novae in the Milky Way". IAU Central Bureau for Astronomical Telegrams. ↑ "M31 (Apparent) Novae Page". IAU Central Bureau for Astronomical Telegrams. Retrieved 2009-02-24. This page was last changed on 3 July 2018, at 15:31.